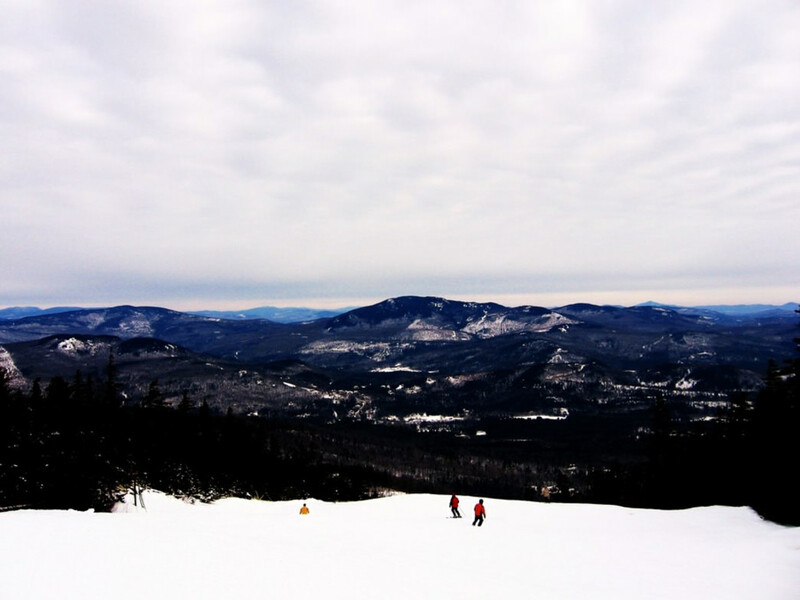 If you consider yourself the Goldilocks of skiers, always on the lookout for the resort that’s just right, you might be able to stop your search at Sunday River in Newry, Maine. It offers up enough variety of terrain to keep everyone from enthusiastic beginners to fearless straightliners happy. And thanks to its northerly location, it gets (and keeps) plenty of snow and makes even more. The base area and nearby town of Bethel have no shortage of options for family fun, and the aprés-ski scene will keep foodies full and partiers dancing. Best of all, Sunday River is close enough to be reachable for a long weekend but far enough away that it never gets too crowded. 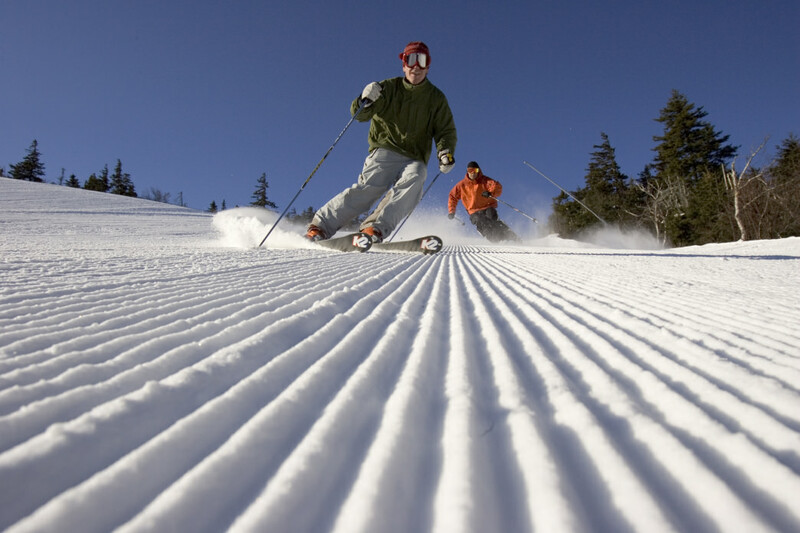 With 135 trails spread over 870 acres and 15 lifts to get you to the top of its eight peaks, even the most gung-ho skier or boarder will have a tough time hitting everything on offer at Sunday River in one weekend. Novices especially are in for a treat, as over 75 percent of the River’s trails are rated beginner or intermediate, but many of those runs are wide enough to allow for huge carving turns and steep enough to offer advanced downhillers a thrill. Even better, Sunday River’s prodigious snowmaking means you’ll rarely deal with trail closures due to inadequate cover. A nice feature of Sunday River’s topography is that you’ll always find a challenge and yet rarely end up in terrain that’s over your head—you’ll find a green circle, a blue square, and a black diamond on most of the River’s peaks. The biggest complaint among those who don’t know their way around Sunday River is that they end their ski day feeling like they spent most of their time traversing from one area to another. It’s true that Sunday River’s eight separate peaks can make navigation a challenge, so it’s best to study a trail map (or rely on a handy online guide) and make a plan before setting out for the day. Three factors should guide your organization: making early morning tracks on Sunday River’s signature corduroy, getting to a good lunch spot, and taking a ride on the mountain’s new Chondola lift. Those in the know arrive early enough to snag a good parking spot at the Barker Lodge area in the middle of the mountain, then catch first chair to warm up on the heavenly rolling groomers found in the here. For lunch, plan a stop for BBQ at North Peak Lodge, pub grub at the Shipyard Brewery at the White Cap Lodge, or a noodle bowl at the Cho Sun Sushi and Noodle Bar at the South Ridge Lodge. In the afternoon, it’s worth the effort to take the Chondola—a chairlift/gondola hybrid that climbs 1,110 feet of vertical in less than seven minutes. This fun feature is the highlight of the $20 million investment in the mountain made by Boyne Resorts, which purchased Sunday River in 2007. Unless you’re a complete newbie (in that case, stick to North Peak), start your day by steering towards the mountain’s right (or west) side. Beginning from the South Ridge Lodge, take the Chondola up and choose between a series of green circles and blue groomers like Northern Lights and Firestar as warm-ups on your way to Jordan Bowl Express. Once you arrive at the top of the Jordan Bowl climb the observation deck, if it’s a clear day, and feast your eyes on a breathtaking, panoramic view that stretches from Canada to the mountains of New Hampshire and as far away as as the Atlantic Ocean. For beginners, Lollapalooza, on the mountain’s far right side, is one of the best green cruisers to be found in the East. Long and fun, this route offers magnificent vistas of the surrounding northern Appalachian mountains. Once you tire of that run, take the epic Kansas back towards the resort’s middle. Do a few laps on Borealis and Aludra, both green circles off Aurora Peak, until you get hungry. At that point, stop at the conveniently located mid-mountain Peak Lodge for lunch. In the afternoon, check out Three Mile Trail off the Barker Mountain Express, Green Cheese and Moonstruck off the Little Whitecap Quad, and Over Easy and Roadrunner off the White Cap Quad. Or you can challenge yourself with blue squares like Wildfire, Monday Mourning, or Sunday Punch. End your day with laps off the Chondola until you’re ready to call it quits. 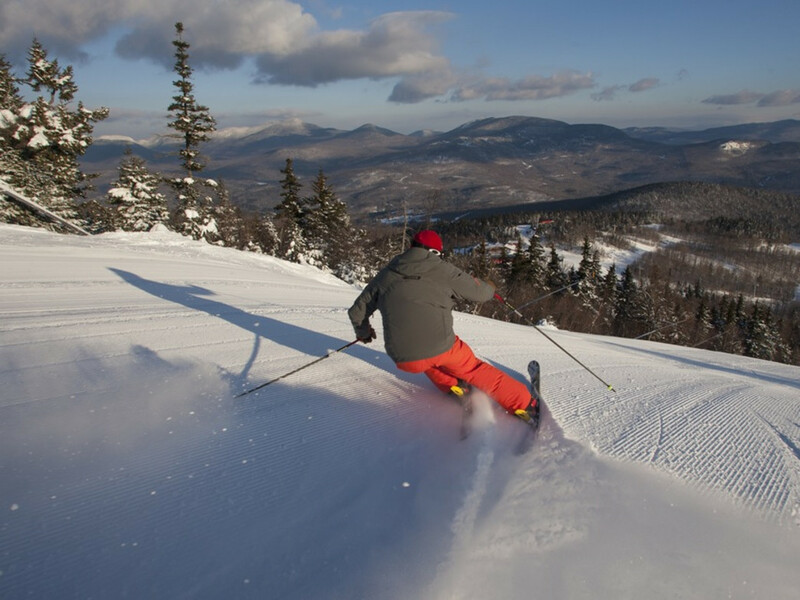 For intermediates, Sunday River is paradise, as blue squares with nice pitch and plenty of space to navigate are the resort’s bread and butter. Once you arrive at Jordan Bowl, hit up Rogue Angel and Excalibur. On your way back east to lunch, do a couple of laps on Northern Lights off the Aurora Peak Quad, then make your way to Spruce Peak and check out American Express and Risky Business. Up the Locke Mountain Triple, dare yourself to connect Goat Path with Lazy River and Tourist Trap—it’ll be the highlight of your day. Cascades, Jibe, and Tempest are good day-enders. 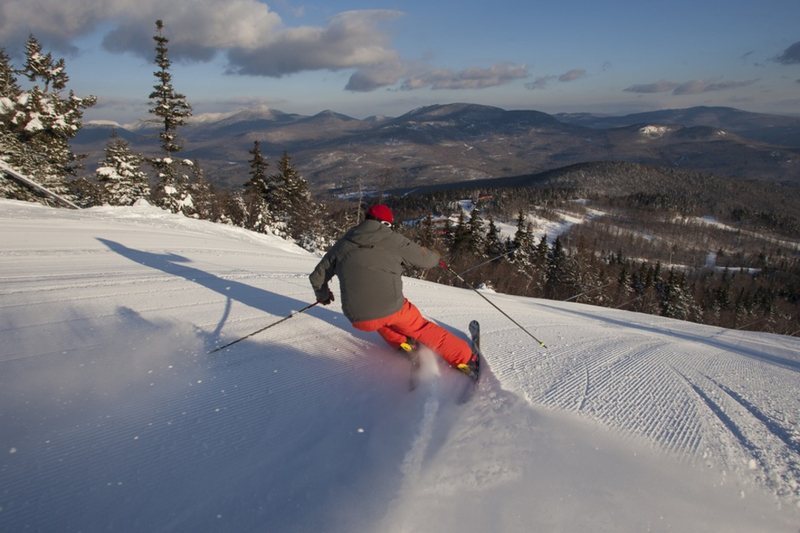 Advanced skiers aim themselves directly at Oz, a magical land with classic New England all-natural skiing and advanced to expert terrain. Ruby Palace, Tin Woodsman, Eureka, and Emerald City are the signature challenges of Oz. Before lunch, hit up the bumpy iCaramba in the Jordan Bowl area, then the serious steeps on Vortex, Supernova, and Black Hole off the Aurora Peak Quad. After eating, continue to work your way east, sampling Northern Exposure, Gnarnia, and Top Gun. White Heat off White Cap Peak, is burly enough to host an Olympic moguls competition and the River’s biggest challenge. End the day alternating between rolling screamers like Right Stuff, Bim’s Whim, Obsession, and Shock Wave.